REVIEW – If your home is anything like mine, remotes rule your life, especially for your home audio/video. If you have ceiling fans with wireless control, it only adds to the clutter. I have been searching for a solution to both eliminate my remote clutter and also add voice control to my four ceiling fans. Olibra has a solution. Enter Bond. Bond Home. 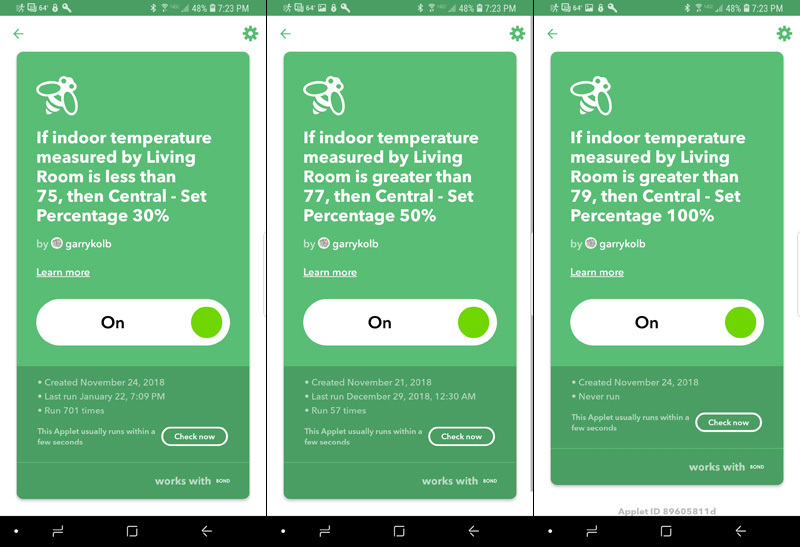 Bond is a hub that adds remote control for wireless ceiling fans, both from Android or Apple devices and from Amazon Echo or Google Assistant. Bond comes with the hub itself, a micro USB cable, wall plug, a very basic setup guide, and a future feature card. There is no network port on the Bond. It connects to your network via Wi-Fi. The design is fairly typical for a device hub. It is glossy black plastic and feels sturdy in the hand. 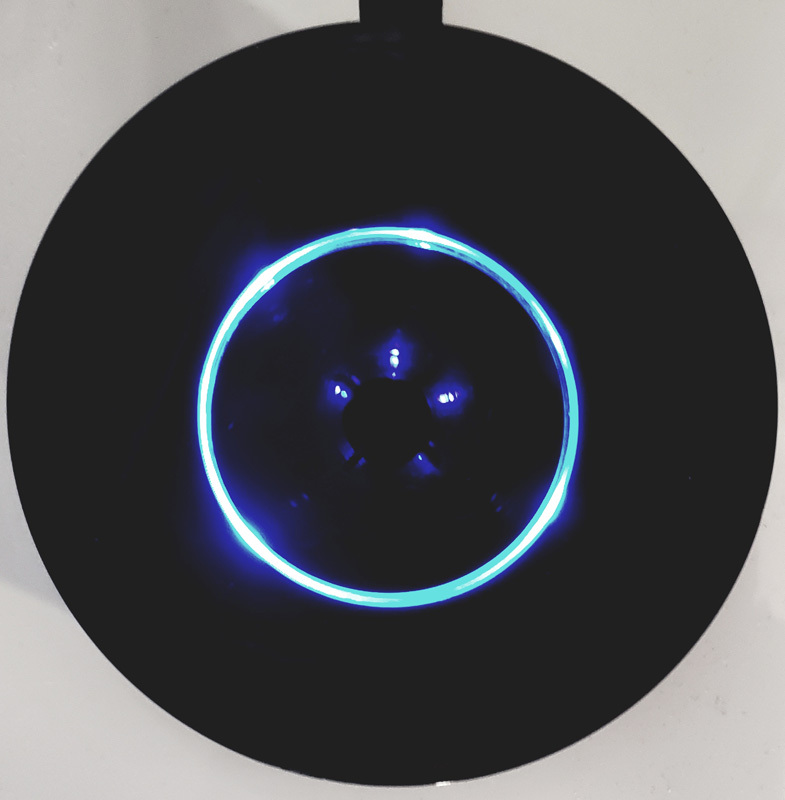 The top center ring lights up various colors, depending on the mode. It shines white when first plugged in, flashes green when ready, shines blue when online, flashes blue in learning mode, flickers blue when learning a remote and shines red when there is a problem. The hub itself doesn’t really do anything but send out signals. The real magic is in the Bond app. Available from both iTunes and the Google Play store for no cost, the Bond app drives all the functions. First, connect the Bond hub to the network. If you have ever added any type of hub to your network, you already know the drill. Install the app, set up an account, connect the hub to your network by providing your network name and Wi-Fi password in the Bond app. Once you do that, the hub indicator ring will change from green to blue, indicating that the hub is online. This is where the fun begins. Click “Add a Device” in the Bond app. The app prompts for the type of device to add. Currently, Bond supports ceiling fans, some electronic fireplaces and is in beta for some air conditioners. 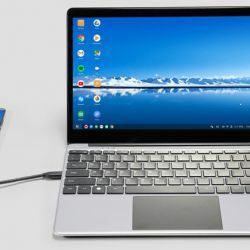 If the app is to be believed, support for a bunch of other devices is in the works. After choosing Ceiling Fan, the app prompts to choose a specific button on the remote and press it while holding the remote within a few inches of the Bond hub. The indicator flashes blue to indicate it is ready to learn. The indicator will flicker as it reads the wireless signal from the remote and then flashes green to acknowledge it read it correctly. Bond maintains an extensive database of fan remotes and their associated signals. Once the hub reads the signal and the app looks up the specifics in the database, it will return a list of functions it thinks the remote has. Confirm that by testing the fan functions by hitting the remote button icons in the app. The app supports multi-speed fans and fans with upward and downward facing lights, with or without dimmers. Once the functions are confirmed, provide a name for the device and it is ready to be controlled from the app. In this screenshot, “Living Room” is the name of the Bond Hub. I have four devices added to that hub, my four fans. Bond can control up to six devices per hub. You can add as many hubs as needed and switch between hubs in the app. Bond supports voice control via both Google Assistant and Amazon Alexa. I integrated with Alexa for this review. Alexa supports Bond via an Alexa skill that needs to be added in the Alexa app. The skill needs your Bond username and password. Once linked, have the Alexa app discovers devices and the Bond devices show up in Alexa. With my four fans, each with a light, eight new devices showed up as expected. Once they were there, I could turn my fans on and off, change speed, and turn the associated light on and off by voice. One of the issues with a device like this is that many ceiling fans remotes toggle the lights on and off. What this means is that the remote doesn’t know if the light is on or off, it just sends a “change state” command to the fan and the fan changes the state of the light. If it is off, it turns on and if it is on, it turns off. Since the app functions essentially like a remote, that isn’t an issue. But, if you add voice control, Alexa or Google Assistant won’t know if the light is on or off, so a voice command to turn it on or off, may not work. Bond has a solution for that with Light State Tracking. Basically, the Bond app remembers the state of any light. So, when you tell Alexa to turn on the light and Bond thinks it is on, it does nothing. The caveat here is that if you use the physical remote, Bond has no knowledge of that. 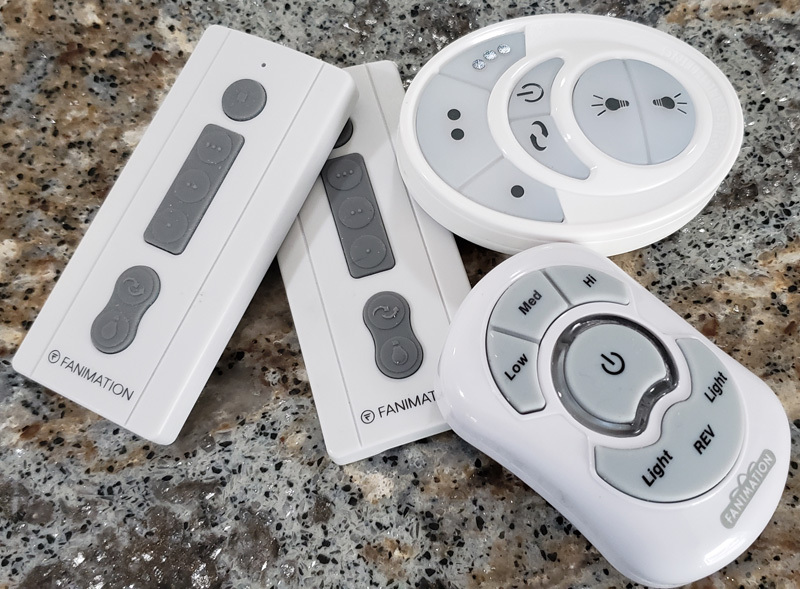 So, if you turn a light on or off with the physical remote, be sure to change it back again, also with the remote, or Bond will be out of sync and think on is off and off is on. All my fans are three-speed fans. The app says that I should be able to control the speed by saying, “Alexa, turn on central fan, speed <1, 2 or 3>”. That has never worked. Alexa acknowledges the request, but the hub does nothing. Instead, I have to say, “Alexa, turn on central fan <33%, 66%, 100%>”, for low, medium or high speeds, respectively. It’s a minor quibble, but “…speed <1,2,3>” makes more sense to me than “speed <x>%”. One ongoing issue is that Alexa and the hub seem to have occasional spats where they aren’t talking to each other. I can’t identify any cause or repeatable series of events that cause it. Eventually, they kiss and make up and everything works as designed. All my fans are RF devices, meaning that the remote uses radio signals for communication. My Bond device is in the living room, near both the central fan and piano fan. It works perfectly with the bedroom fan and bathroom fan that are in different rooms. Bond also supports infrared (IR) devices. Of course, this means that the Bond device has to be able to physically see the device to be controlled, as IR signals are light and require a line of sight from the hub to the device. Another nice app feature, at least on Android devices, is widget support. You can add one widget for each fan, including one or more buttons on the widget. If you include a single button, the widget shows that one function button. I chose to add most of the features – light on/off, fan power and all three-speed settings. The widget produced is a clever scrolling widget, allowing access to all the buttons from a single, scrollable widget. Pretty slick. 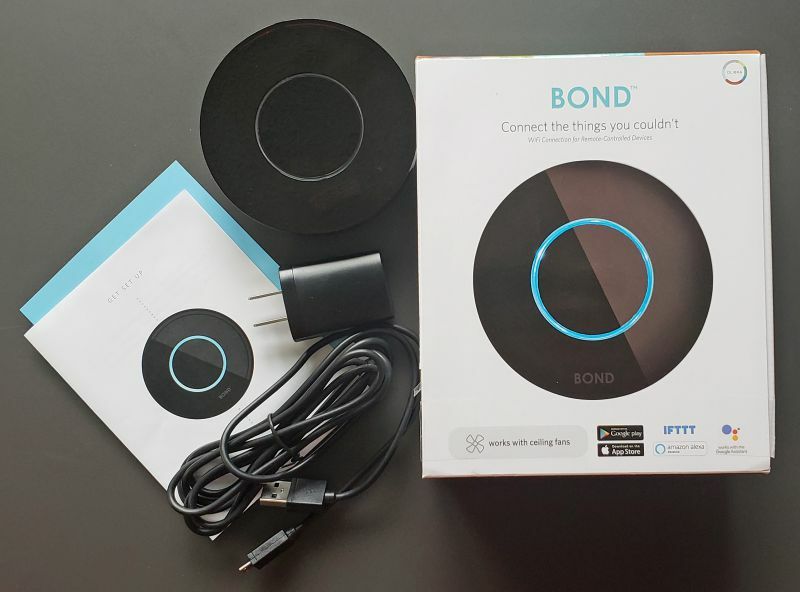 Finally, Bond supports IFTTT (If This Then That). I set up automations with my Ecobee 4 thermostat. If the temperature in the living room is under 75 degrees, IFTTT has Bond set the fan to low (30% is IFTTT’s speed 1). IFTTT triggers Bond to bump the central fan to 50% (speed 2) if the living room hits 77 degrees and 100% (speed 3) at 79 degrees. This was the only solution of this type that I could find. It brought voice and/or phone control to my fans, and eliminated clutter in the living room and on the nightstands. Sitting in the chair after playing a couple hours of pickleball and being able to say, “Alexa, turn central fan on, 100%” is a real asset to my automated house lifestyle. Having the fan automatically speed up and slow down with the temperature when we have the windows open is a real plus as well. Lutron has just announced a potential competitor in this space, the Caséta speed controller, although Lutron’s website makes it look like the fan needs to have a wired controller. That doesn’t help me as my fans are all wireless. We shall see once more details are released. Overall, I really like the Bond hub and what it has added to my automated home. It is a bargain for the price. Source: I purchased Bond with my own funds. This is so timely. I’ve been looking hard at this. I was thinking more along the line of a replacement of the wireless unit in my fan, of course that would incur cost for every fan. One questions, do any of your fans have dimmer lights? I am wondering how it would work with that. Bryan – an update. Bond saw my review and opened a support ticket to resolve my dimming issue They expect that dimming should be working as expected. I will keep you posted on the progress. Bryan, I’m glad you asked. I have dimmers on all my fans. On the remote, you hold the dim/brighten button continuously to dim/brighten. But, we never dim the lights, so I never really tried it on the Bond. Suffice it to say that the dimming feature falls into the “what needs to be improved” column. Because it is a continuous hold type of button on the remote, I wasn’t sure how it would work on the Bond, and basically, it didn’t. I tried two different types of fans, and neither dimmed or brightened as expected. I tried a push-push-push method and a push and hold method and neither one seemed to to much to the light, until eventually, the light turned off. I hit it again for a while and it came back on full brightness. No matter how I tried to hit or hold the Bond button, I couldn’t get it to step down in brightness. So, if dimming/brightening the light is a hot button for you, Bond doesn’t seem to offer a viable solution and you’d need to still use your remote for that. Hot button. Well played. I don’t think it is a show stopper, and sounds like they are addressing it. I am so excited to read about this. Our home was built back in 1998 and back then we had 2 switches in every room that had a ceiling fan. One controlled the light and the other turned the fan on/off. You then had to pull a chain to change the speed which we never did. When we had to start replacing ceiling fans and I saw the remotes, It was so disappointing. I have been looking forever for something like this that will let me control via Alexa. Take my money please! I can’t wait till they can handle motorized window shades. 6 devices per hub does stink though. First, let me say how impressed I am with Bond support. They are very responsive, and not just because of this review. I had contacted them when I first got the Bond about another issue and they were just as responsive. Bottom line is that it is partially Bond’s fault and partially mine for the dimming not working. Second – my fault: After testing the Kichler, I tested the Fanimation fans. There are two dimmer button on the Bond screen, and as it turns out, I was using the wrong one. When I used the correct one, and held it continuously, the light on the fan dimmed and then brightened as expected. So – to answer Bryan’s question fully about the dimmer function – it depends on your fan. Having said that, they are constantly improving functionality at Bond, and do fully support a wide range of fans. And, their customer support is top notch. Obviously this company has invested more in publicity than developers. Since I saw “Compatible with any remote-controlled ceiling fan” in their website, I purchased this item hopping that I was going to be able to use this hub to control 4 of 5 fans in my house (one doesn’t have a remote control). After hours of troubleshooting trying to configure one of my Hunter brand fan remote with no luck I decided to contact customer support only to find out that I was able to set it manually but it was not going to have all of the functionalities of the remote (funny enough I was only able to set the light function by default, but I was able to add the fan as an extra function as on/off without speed options). In summary, this device is too expensive for the little benefit and low quality build it provides. Great idea but awful execution. I’d not recommend. Sorry to hear about your experience. My Fanimation & Kichler fans are well-supported, other than the dimming on the Kichler. I am surprised to hear that Hunter support is lacking on the Bond, given Hunter’s presence in the fan market, so I understand your disappointment. Well I received my Bond this past Sunday. I was able to hook it up to two MinkaAire and one Fanimation fan we have in our house. The rest of our fans do not have remotes. Dimming features and everything seems to work. The only thing I could complain about is if the fan is off and I ask it to just come on, it comes on at the fastest speed possible. It is then possible to ask Alexa to set the fan speed to #. We have never run our fans at the highest speeds even here in south Texas. What was cool was the one fan I have in our master bedroom has the remote built into the wall switch. I just moved the Bond to be near it to program it and it worked perfectly. Now they just need to get the automated blind support in place and we can be in voice controlled heaven. I turn my three-speed fan on with, “Alexa, turn on central fan speed 33%” and it turns on at speed 1. Without a speed qualifier, mine turn on at 50%, or speed 2. Try adding that speed qualifier to your turn-on command.